The Shape Detection API makes a device’s shape detection capabilities available on the web, letting you identify faces, barcodes, and text in images. It does this without the use of a performance-killing library. As Chrome 70, this API is available for experimentation through a Chrome origin trial. The Shape Detection API consists of three APIs: A Face Detection API, a Barcode Detection API and a Text Detection API. Given an image bitmap or a blob, the Face Detection API returns the location of faces and the locations of eyes, noses, and mouths within those faces. To give you rudimentary control of performance, you can limit the number of returned faces and prioritize speed over performance. The Barcode Detection API decodes barcodes and QR codes into strings. (There is a QR code demo at https://qrsnapper.com/) The value can be anything from a single set of digits to multi-line text. The Text Detection API reads Latin-1 text (as defined in iso8859-1) in images. All of these APIs only expose what’s supported in the underlying device. 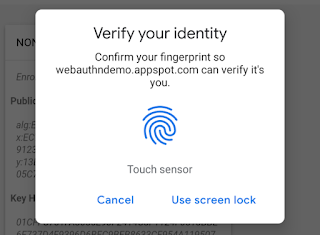 Also enabled by default are macOS’s TouchID and Android’s fingerprint sensor via Web Authentication. These allow developers to access biometric authenticators through the Credential Management API‘s PublicKeyCredential type. Dedicated workers now have a name attribute, which is specified by an optional argument on the worker’s constructor. This lets you distinguish dedicated workers by name when you have multiple workers with the same URL. Developers can print name in the DevTools console which will make it easier to debug workers. When the name parameter is omitted, an empty string is used as the default value. For more information, see the discussion on GitHub. An optional PostMessageOptions object has been added as an argument to postMessage() for 6 of the 7 interfaces where it’s supported, specifically, DedicatedWorkerGlobalScope, MessagePort, ServiceWorker, ServiceWorker.Client, Window, and Worker. This gives the function a similar interface on its definitions and allows it to be extended in the future. Because broadcastChannel.postMessage() doesn’t take additional arguments (such as transfer) it is not being changed. This getConfiguration() was implemented according to the WebRTC 1.0. Specifically it returns the last configuration applied via setConfiguration(), or if setConfiguration() hasn’t been called, the configuration the RTCPeerConnection was constructed with.